The City Impact Lab brings together those making an impact in government, the arts, neighborhoods, nonprofits, and business to share breakfast and jumpstart their day with tactics for success. Each breakfast includes 2 speakers who share their personal experiences and strategies that have lead to their success. 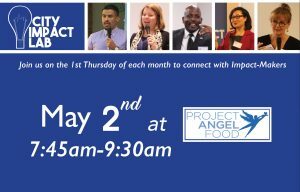 Speakers: Richard Ayoub, Executive Director, Project Angel Food Christopher Pearson, Vice President, Developing Planning Hudson Pacific Properties Inc.